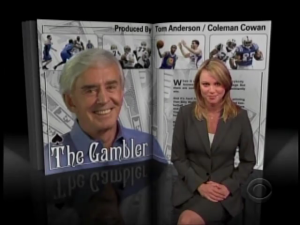 Las Vegas sports betting legend Bill Walters has never had a losing year – a winning a streak that’s made odds makers call him the “most dangerous sports bettor in Nevada.” Lara Logan reports. Tom Anderson and Coleman Cowan are the producers. When it comes to gambling, everybody knows the house has the advantage. But there are some high rollers who consistently win. And it’s hard to find anyone better at winning than Billy Walters. He bets on football and basketball, is worth hundreds of millions of dollars, and has been so successful that many Las Vegas bookmakers are afraid to even take his bets. Billy Walters has been almost as elusive as Howard Hughes, avoiding publicity, reluctant to reveal his secrets. But after 30 years of unprecedented success, the man who calls himself a Kentucky hillbilly, agreed for the first time to open the door into his betting life in Las Vegas – a life he describes as one long hustle — in betting parlors, in pool rooms and on the golf course.